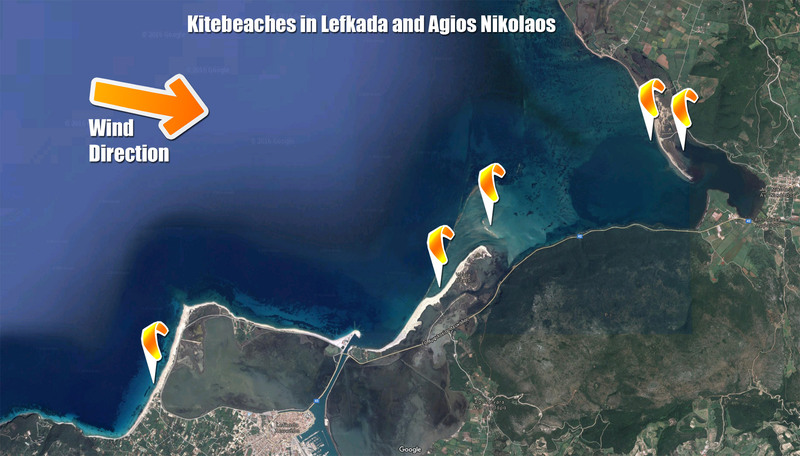 Our main kite spot for the months of May, June and early July is this flat water kite heaven. It can be accessed via a wooden bridge, hence the name. The entrance to this beach is off of the causeway between Lefkada and Agios Nikolaos. While parking is limited, it rarely is a problem unless you are right in the main season. This beach offers turquoise blue water, which although it gets deeper quickly, you can stand nearly everywhere. 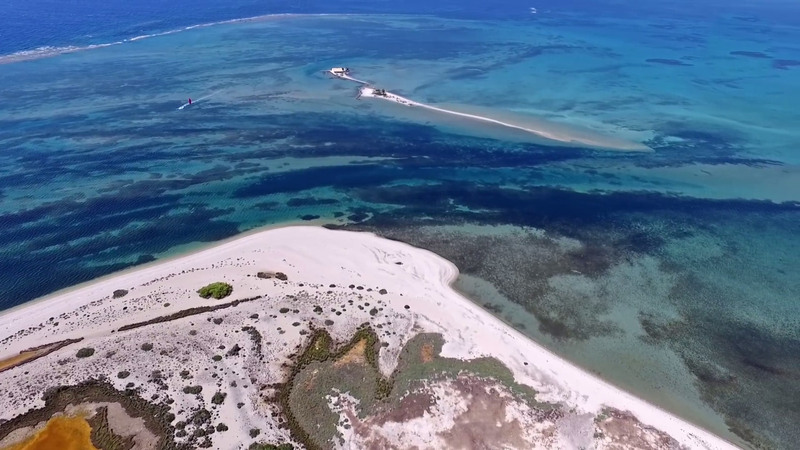 It is a wonderfully safe place to kite as the wind is cross on-shore (leaning more to on-shore) and it is flat water all around due to the reef upwind which protects it. This is the beach to launch and land from if you want to kite around The Church, however you must be confident at riding up wind to get back, as it’s quite a way. Otherwise, just head on down to Agios Nikolaos and we’ll be waiting for you! This is an isolated beach which is popular with sunbathers, again there are no facilities here so go prepared! This is our personal dream spot and it is easy to see why. Turquoise blue water, white sand under foot, flat and shallow. What more could you want!?! 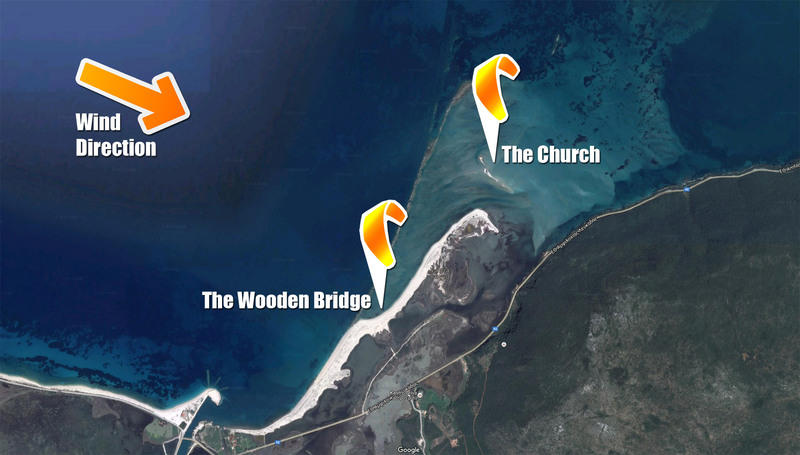 The Church is only accessible via the Wooden Bridge Beach or by joining us on one of our BBQ downwinders. This is as remote as it gets so go prepared as there are no facilities here – water, water everywhere and not a drop to drink! If you haven´t seen it already, click below for our spot guide on both the Wooden Bridge and the Church. The main months are the same as the Wooden Bridge Spot. 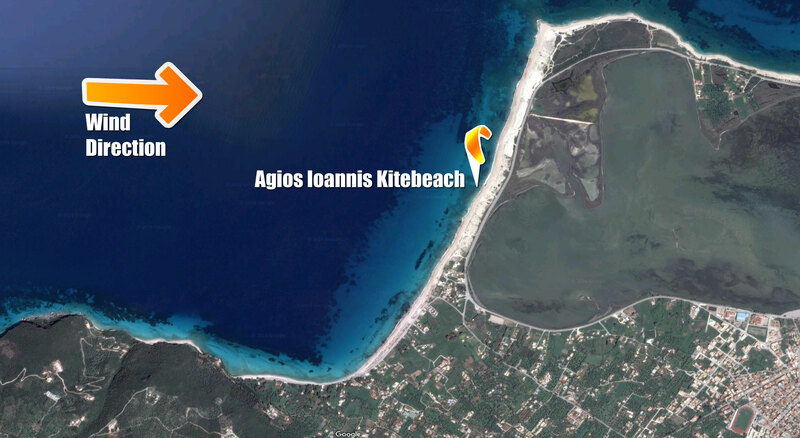 Agios Ioannis beach is on Lefkada and is situated to the south west of the main town. This is our failsafe beach as it is pretty much windy every single day, from middle of May to middle of September. Due to the cliff and hills, the wind shifts its direction more towards the West and often is stronger here than on any other spot. Most accommodation options are within walking distance to this beach and while it is nearly always windy (due to its huge lagoon creating a very strong, local thermal), we mainly use this beach when it is not windy at the other kite spots. The conditions here are rough chop with small waves and a medium size shore dump to get over on entering. There are a few rocks (not sharp) near the left side of the beach so we recommend to enter the beach further away from the restaurants and buildings (near the windmill towers). There is plenty of parking available on the wide road encircling the lagoon. This wonderful area has two kite spots in one. On the upwind side you have a cross on shore bay approximately 3kms wide and on the downwind side you have an enclosed lagoon that is buttery flat. 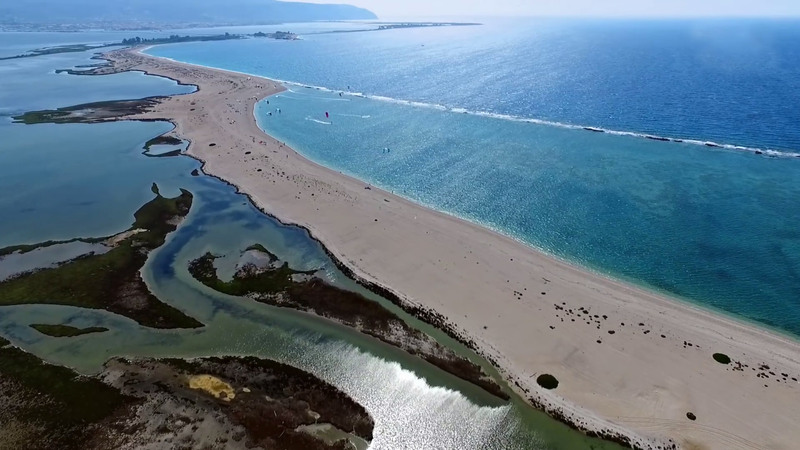 The bay area of Agios Nikolaos is tucked away in the curve of the land to the north of Lefkada and is divided in two by a sand spit covered in reeds. The upwind side offers cross on-shore conditions which is a combination of flat and choppy water (not unlike Gokova Bay for those of you who been). It is shallow a fair way out and the ridable area is approximately 3kms wide. The wind here is always lighter than all other spots and you will be riding bigger kites through the months of June/July/August. On the other side of the sand spit is an enclosed lagoon and is accessible from the upwind side, by kiting around the end of the spit. The conditions here are akin to the lagoons in Brazil, buttery flat! Although you can stand in most areas of the lagoon, we recommend this spot for those who can confidently ride up wind back to the launch/land site. 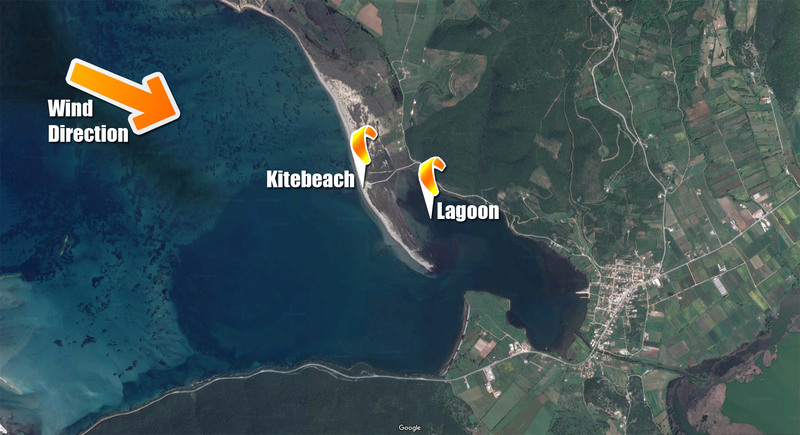 Since it is only 10 kilometers from Agios Ioannis Beach down to the Lagoon, depending on the wind conditions we run downwinders starting either in Agios Ioannis Beach or the shorter version, beginning at the Wooden Bridge Beach.